Spread is a term from the financial lingo used to indicate the difference between the bid and ask rates of a currency pair. Before opening a trading account, almost all Forex traders would scout for a broker offering low spread. Even novice traders know that low spreads would make it easy to enter and exit a trade at short notice. Scalpers who aim for 3-5 pips profit per trade are constantly on the lookout for brokers offering extremely narrow spreads. However, there is much more to spread than defining the entry and exit price. Let's study the impact of the spread on FX trading. Before we study how spread works, it would be better to understand the importance of a pip in the Forex quotes. As you may already know, a pip is the smallest possible price movement in the exchange rate of a currency pair. 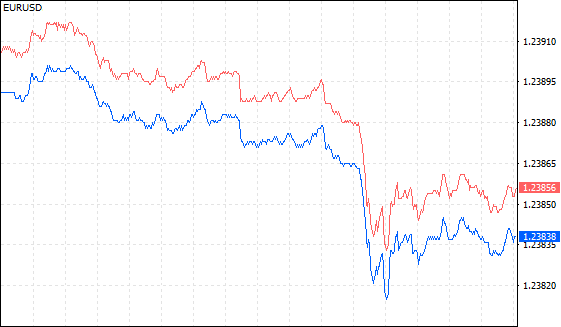 In a currency pair priced to four decimal places, the smallest change is represented by the last decimal point. It is equivalent to 1/10,000 of a unit. Therefore, for a currency pair with four decimal places, one pip is equal to 0.0001. In case of the pairs quoted in Japanese yen, which are priced to two decimal places, one pip is equal to 0.01. Most of the retail Forex brokers now offer five decimal pricing. The fifth decimal is called a pipette or a fractional pip, which is 1/10 of a pip. Therefore, an increase or decrease of 10 pipettes will lead to a 1 pip change in the exchange rate of a currency pair. The yen-based pairs will be quoted to three decimal places if fractional pips are used. In the foreign exchange market, banks act as the tier 1 liquidity providers and compete among themselves to offer the best bid and ask price. A quote, which is also referred to as the real price, passes through prime of prime brokers and reaches the Forex broker who serves retail clients. To compensate for the operational expenses and generate profit from the business, a broker deducts a pip or two from the bid price, while adding one or two pips to the ask price. For example, let's assume that a broker receives 1.2420 and 1.2421 as the bid and ask rate for the EUR/USD pair. If the FX broker intends to add a spread of 2 pips to compensate for his expenses, then the final bid and ask price offered to the client will be 1.2419 and 1.2422. A client will be able to sell the euro only at 1.2419. Likewise, the euro can be bought only at 1.2422. Such a setup ensures that the broker is compensated for the service offered. Depending on the nature of risk management used by a given broker, the order may be immediately passed on or grouped together with several other trades and then hedged with the tier 1 prime broker. The value of each pip is dependent on the traded currency pair, lot size, and the exchange rate. To understand how the value of a pip is calculated, let's assume that a trader opens a €200,000 Buy position (2 standard lots) in the EUR/USD pair at 1.2440. Further, let's imagine that the trader closed the position at 1.2460, with a gain of 20 pips. To buy EUR/USD at 1.2440, a trader must pay $248,800 (1.2440 × 200,000) for €200,000. The smallest possible price movement is 0.0001 (one basis point). In dollar terms, the value of one pip is equal to 16.05 × 1.2460 = $20. The overall profit from the trade = €16.05 × 20 pips = €321 or $400. Now, let's assume that the trader has gained 23 pips instead of 20 pips in the example discussed above. The overall profit from the trade would be €369 or $460. A difference of three pips has resulted in an additional gain of about €48 or $60. We can now apply the calculation to understand the impact of the Forex spread on the net returns. In the example above, if the Forex broker offers quotes with a spread of 2 pips, then the amount lost (in form of spread) by the trader is $20 × 2 = $40, i.e., 10% of the profit made by the trader ($40 / $400 × 100%). Alternatively, let's assume that the trader closed the position at 1.2410. In dollar terms, the value of one pip is still the same $20. The overall loss from the trade = €16.12 × 30 pips = €483 or $600. If the Forex broker offers quotes with a spread of 2 pips, then the amount lost by the trader in form of spread is $20 × 2 = $40. So, the spread has contributed to 6.66% of the net loss ($40 / $600 × 100%). As you can see, the actual spread expenses are based on the size of profit or loss on a trader’s position. Large volume traders may gain or lose thousands of dollars by a difference of one pip. That is one of the reasons for informed traders to look at the spread offered by a Forex broker before signing up for a trading account. The spread indicates the cost a trader will be paying for executing buy or sell transactions. Most of the brokers provide a detailed list of spreads they offer during normal conditions. The spread will be a little higher for mini and micro accounts when compared with normal or pro accounts. Generally, mini and micro account holders tend to trade a lesser number of lots compared to other account type holders. Thus, to compensate for the loss in revenue, brokers tend to use a wider spread for smaller accounts. The spread may be widened considerably during periods of high volatility. This protects brokers from losses due to off-quote execution. Forex brokers, who are market makers, have to hedge their risk as they act as a counter party to the trades made by their clients. Therefore, they widen the spreads during the announcement of a high impact news, minimizing their risks. However, companies with bad reputation tend to misuse the option and widen their spreads so much that the clients will be at a great disadvantage while buying or selling a currency pair. Imagine going short in a currency pair with a 50 pip spread. The mark-to-market loss will begin at about $500 for every lot sold, with such a wide spread. It is extremely important to consider spreads while choosing a Forex broker. A difference of one or two pips may be the difference between a successful and failed Forex trader.